Love this zebra print diaper cake! Jennifer created this cute cake with delightful ribbons and bows...and then she shared it with all of us on our baby shower cake gallery! It is readers like Jennifer who make this website such a helpful, idea-filled resource for all the rest of us. Take a look at her darling cake below. Jennifer, your cake is wonderful! Thanks for sharing it with us!! 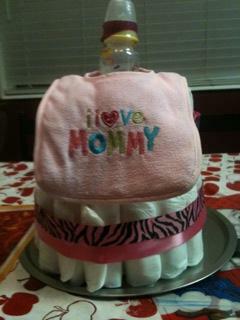 This is my simple 2 tier diaper cake! Its called "The princess Zia" I made it specially for my very good friend who is having a girl and its themed pink zebra print! did one 8 oz bottle on bottom and a 4 oz on top the front has the 2 cute pink bows and on the back it has a bib! has 25 rolled up size 1 diapers on bottom and 18 rolled up on top, this is a more simple one! Comments for "The princess Zia"
Delightful! 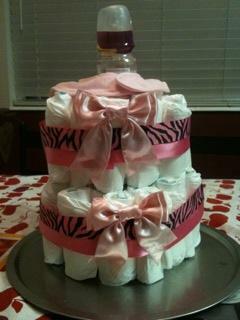 I love this zebra diaper cake! thank you for your awesome work! one of the best i've seen.